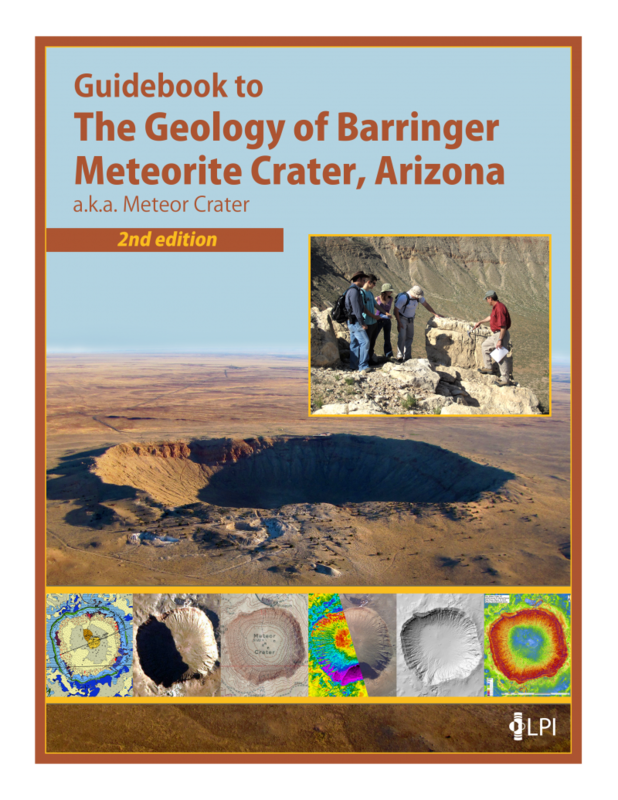 The Lunar and Planetary Institute (LPI) is releasing a greatly expanded edition of David Kring’s Guidebook to the Geology of Barringer Meteorite Crater, Arizona (a.k.a. Meteor Crater). The book is being distributed electronically so that it is available to the entire planetary science community. Impact cratering is one of the most important geologic processes shaping planetary surfaces, particularly on airless bodies. The Barringer, or Meteor Crater, impact site is arguably the world’s best preserved and most dramatic looking impact crater. Because of its similarity to lunar terrain, NASA used the crater during the Apollo era as a site for testing equipment that would be used on the lunar surface and for training astronaut crews. The book summarizes over 100 years of exploration at the crater and describes how impact cratering processes excavated the bowl-shaped cavity, distributing over 175 million metric tons of rock on the surrounding landscape. Kring explores both the geologic processes that shaped the crater and the biological effects the impact event may have had on an ice-age community of mammoths and mastodons. The guidebook now contains over 150 figures with more than 200 photographs of the crater and samples from the crater. The newest edition of the guidebook was used by members of the Meteoritical Society who recently participated in a field trip to Meteor Crater. The guidebook is certain to be a resource for many years, as Meteor Crater continues to be an important training site for planetary scientists, such as LPI’s Field Training and Research Program at Meteor Crater. A large portion of the expanded material in the second edition is based on research conducted by students in that training program. LPI has produced a digital copy of the guidebook and is making it available to the planetary science community as a complimentary download. LPI also curates a diverse array of data from previous studies of the crater at that same website, which the planetary science community is also free to access.